Remember when you were a kid and chalking your driveway was the highlight of your summer? 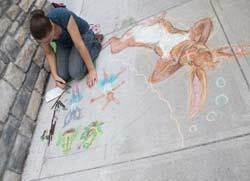 This month doesn't miss Chalk Fest, the annual sidewalk painting competition held in downtown Glens Falls NY. Chalk Fest will be held on on August 19, 2010 from 5-8pm at the plaza at Lapham Place, in between Glen Street and City Park. There will be live music by Rich Ortiz and snacks provided by Wild Bill's Country Kettle Corn and ADK Italian Ice.